30/04/2018 Advance Dermocare is currently under investigation for causing the condition Megaesophagus in dogs, with University of Melbourne reporting 74 cases. 06/06/2018 – ABC have reported Melbourne University U-Vet are now investigating 100 Megaespohagus cases related to Advance Dermocare. Advance is made by Mars Petcare who have a solid hold on breeder communities and shows. As one of the original brands marketed as being Australian they have a very loyal following. Given Mars are ranked by Forbes as the 6th largest privately held company in the United States, you would expect a product such as this to have a high standard of production. They certainly have the money for it. 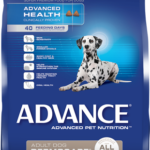 Advance Dermocare is targeted at dogs with itchy skin or allergies, but in reality it’s nigh on a vegan food. Most would assume a dog food would be meat-based, or at least contain a significant amount of meat, but given most people wholeheartedly trust these brands the truth is rarely realised. Advance know this, and that’s why they sell you “super premium” rice and corn at an incredible mark-up. Firstly, if you read this Facebook post, you’ll see many dogs with allergies have been miraculously cured by Dermocare as an anti-allergenic food. The reason for this isn’t actually miraculous, it’s because rice isn’t a common allergen, and neither is corn if processed correctly. Most food allergies are caused by the likes of wheat, soy, and other nasty substandard ingredients, and some dogs are allergic to meat proteins such as chicken. Given Dermocare doesn’t have any of these ingredients it means a dog won’t suffer allergies from the food. That’s the reason Dermocare “works”. Secondly, I can’t ignore many people have religiously fed this food for decades to dogs who’ve led healthy lives. Dog food ingredients are listed in descending order of weight prior to cooking. The first ingredient is rice, the second corn gluten, and the third corn. The fourth ingredient is chicken fat, and given the fat content of the food is 15% we can assume the chicken fat accounts for most of this. That means the rice and corn will amount to a very minimum 45%, but the estimated 42.5% carbs would suggest the grains are very significant. Put it this way, the tuna as the 5th ingredient is definitely less than 15% of the food, but realistically I would guestimate a single digit percentage. They may advertise the food as “Tuna”, but note they don’t tell you how much tuna. I’ve rated the food 2 stars, which is all I can do until science proves rice and corn is better for a dog than meat. It would seem a dog can lead a relatively healthy existence on rice, corn, and chicken fat. Rice, Maize Gluten, Maize, Chicken Fat, Tuna, Pilchards, Natural Flavour (Chicken), Beet Pulp, Iodised Salt, Sunflower Oil, Potassium Chloride, Inulin, Choline Chloride, Histadine, Inositol, Dicalcium Phosphate, Plant Extracts (Tomato Powder, Marigold Meal), Taurine, Vitamin E, Vitamin B3, Zinc Sulphate, Vitamin C, Citric Acid, Calcium Carbonate, Beta-Carotene, Antioxidants, Iron Sulphate, Vitamin B5, Copper Sulphate, Vitamin A, Vitamin B2, Vitamin B12, Potassium Iodide, Vitamin B1, Selenium, Vitamin B6, Vitamin B9.